I got this book for Christmas of my friend, i had read feed so i was looking forward to reading the 2nd book in the series! Shaun's life has turned upside down since the loss of his sister, he is trying to deal with her loss, run the company they built together and hold himself together in front of his staff (which is hard when you can hear you dead sister talking to you in your head) but his life is about to get turned even more! When Kelly from the CDC fakes her own death and tracks him down with important information about the virus he starts digging in to research. when outbreaks start happening everywhere he steps he knows the conspiracy is far from dead! With unexpected alliances, surprise enemies will Shaun uncover the truth behind the conspiracy that killed his sister or will he suffer the same fate? WOW! Just wow! 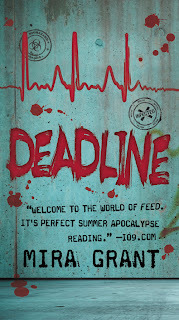 I loved Feed and didn't think the series could get better but this book didn't disappoint it was just amazing! I loved just following the team as they tried to uncover the conspiracy that killed George! I felt like I was right there! The story line was amazing! None stop constant action! Guns, gadgets and endless numbers of zombies! I thought the plot of the story line was amazing; I love a book where I can’t predict what is going to happen and this as one of those books. I think this is the best zombie series I have read! Mira Grant is just amazing! When I read her books I can see the storyline so vividly! Even though if you read this book get tissues ready I cried my eyes out at one point! And as if the storyline isn't shocking enough the end is the cliff hanger of all cliff hangers! I hand to read the back page 3 or 4 times before I believed what I was reading! it was just brilliant! Normally I love a book with a love story in it but you don’t miss it in deadline because you haven’t got time to! People are dying, zombies are going, the team is constantly on the run and evil people are everywhere its just non-stop action! I love Shaun just as much in this book, in Feed he was an outrageous, risk taking ladies man but in deadline you see a whole different side. He no longer goes out into the field and pokes things with sticks instead he struggles with the death of his sister and the new responsibility of running the company not to mention uncovering that the conspiracy his sister died for runs deeper than he once thought. There are some funny moments when he's speaking to george or winding people up and some really sad get the tissues ready when he is trying to cope with her death! This book was amazing! i literally can’t fault it! 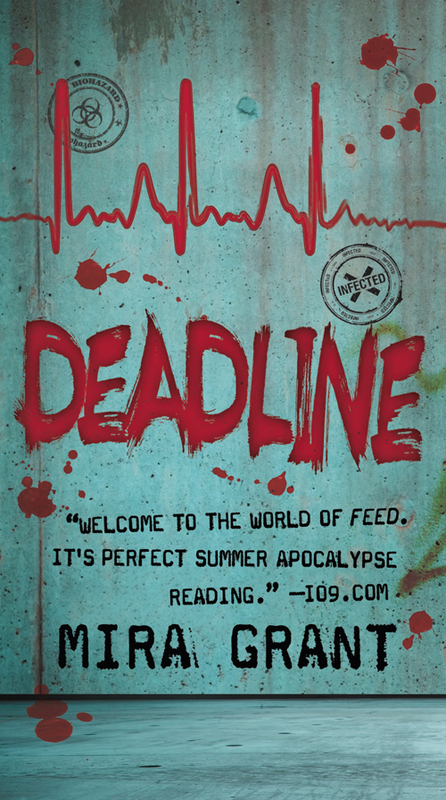 its action packed, it has zombies and government conspiracies what more could you want!